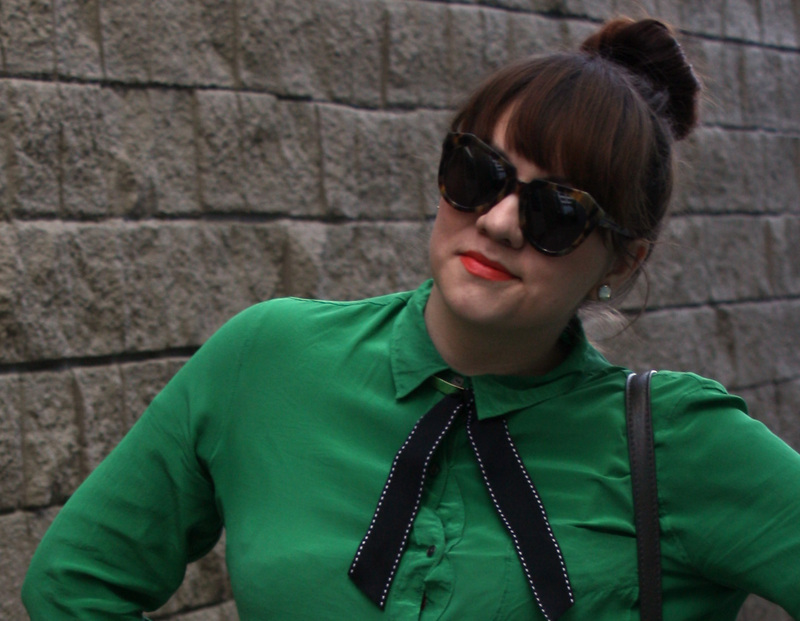 When I was getting dressed this morning, I knew I wanted to wear a tie with my green silk blouse. The only trouble is that I don't own any ties. So I went to my craft box to see what ribbons I had. I considered a few options but ended up using the pretty ribbon from a Net-a-Porter package. The ribbon was too short to tie around my collar, so I just knotted it onto the metal collar ring I own (similar one here).Ta da--instant DIY'd neck tie! My mani of the day is brought to you by my impulsive trip to CVS where I spotted tons of new Sally Hansen nail strip patterns. Snakeskin print, love letter, florals, tweed, argyle, Valentine's-themed. Before I even knew what was happening, I had $80 worth of nail strips in my hands. After I calmed myself a bit, I managed to narrow my options down to the "Mod About You" pattern you see below and a Valentine's Day-themed XO pattern. But in all honestly, I probably would have walked out with a lot more if my sane sister wasn't on the phone with me at the time and convinced me that I really didn't need more than two. Thanks, sis! My final note of the day is for my Bay Area readers. As you may know, Forever 21 is opening a new location in San Francisco on Stockton Street this week. 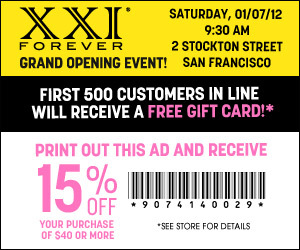 I'll be there on opening day to shop in the shiny new store and share my favorite picks with Bay Area shoppers. If you live in or will be in San Francisco this Saturday, stop by and look for my blog logo around the store to see what I love and enjoy 15% off your purchase of $40 or more with the coupon below. If you're not in the Bay Area, have no fear! I will be posting photos on my Facebook page so make sure you're a fan! Confession: I have an adorable button down with a similar tie as yours but have yet to wear it. I think it's time. I love this look soooooo much. It's easily one of my faves! And, I really need to get on the nail strips. It has to be waaaaay easier than painting them. Yes yes yes! Wear it! And try the nail strips! They really are quite easy! And just like polishing, the more you do it, the easier it gets! love the nails! 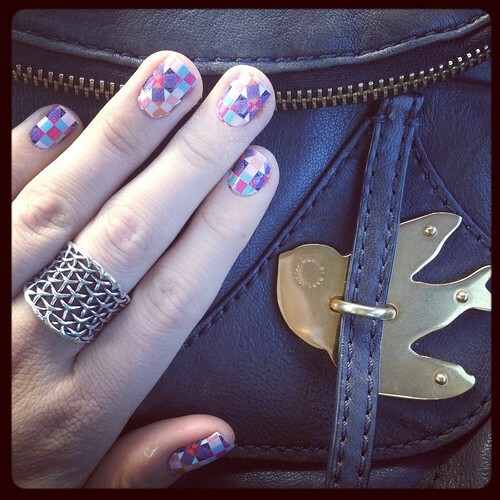 I love the sally hansen nail strips also..they are the best and so easy to use! I love that you got crafty to make your look work this morning. 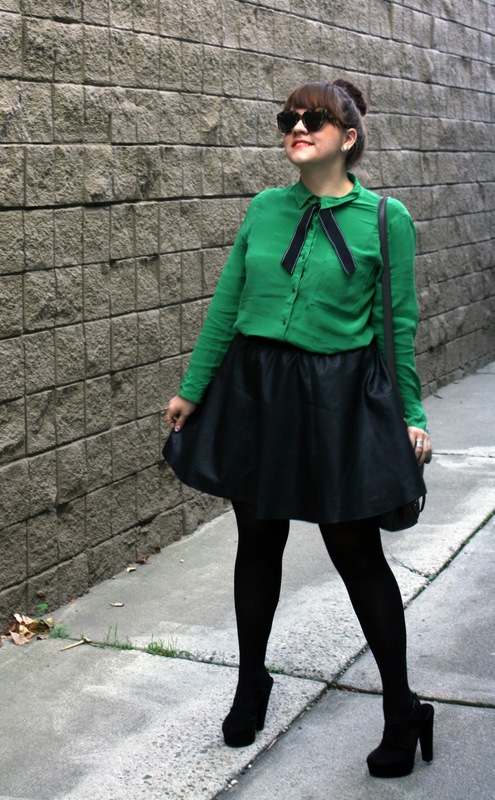 I do heart green and black so much! $80 on nail stuff? What are you some kind of baller now? JK. That's a great idea, Eli!